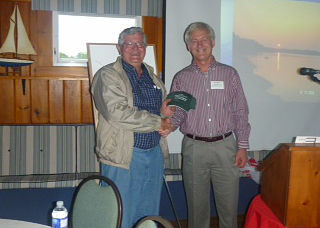 The MICA AGM was held on Tuesday June 12 at the Lunenburg Yacht Club. With approximately 50 members in attendance, Chair John Meisner reviewed accomplishments and highlights of the year. Foremost was the recent acquisition of Shag Island with the Department of Natural Resources. John thanked directors, committee members, sponsors, donors, volunteers and MICA members for their significant work, committment and support throughout the year. With regret, the resignations of Sherrill Harrison and Dr. Brom Hart were accepted by the board however thankfully both Sherrill and Brom offered to continue working for MICA and in Brom's case, continuing as Co Chair of the Gala Dinner and Auction. Janice Tanner Ernst was welcomed to the board as a new director. 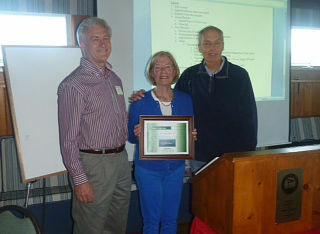 Chair John Meisner and Founding Chair Michael Ernst presenting a Certificate of Appreciation to outgoing director Sherrill Harrison. David Corkum, a local resident and area historian, gave a very interesting, informative and thought provoking illustrated presentation on the Mahone Bay islands. Chair John Meisner presenting a token of appreciation to the guest speaker David Corkum.